Hull number four in the Benetti Mediterraneo 116 series of 35.5 metre motor yachts has been sold with Asia Yacht Management Company introducing the buyer. Due for delivery in spring 2019, this all-GRP yacht will be built to RINA classification, using the same platform as the first hull in the series Oli, which was delivered last year. Accommodation is for ten guests split across five cabins, including a full-beam owner’s suite on the main deck and four VIP suites on the lower deck. Meanwhile, the crew quarters allows for staff of up to seven people. The main saloon features a separate dining area with a round table and an adjacent galley with ample worktop space. Moving up to the sky deck via a built-in elevator, guests will find a family-friendly game room. Another key feature is the large sundeck with built-in barbecue and a custom table that can seat up to 14 people. Power will come from a pair of 1,400hp MAN V12 diesel engines that will allow for comfortable cruising at 14 knots and a top speed of 15 knots. When trimmed back to ten knots, she will boast a maximum cruising range of 3,000 nautical miles. 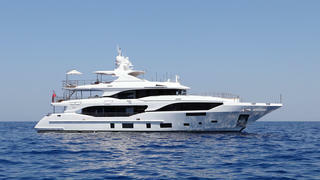 The asking price of the fourth Benetti Mediterraneo 116 yacht has been withheld.